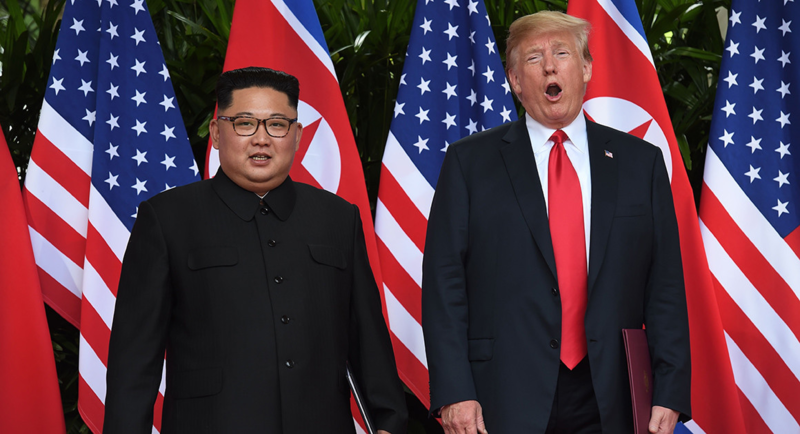 Chairman Kim Jong Un of the Democratic People's Republic of Korea and President Donald Trump. 510 days ago, we, the American people, were served notice of a complication in our storyline when our own insecurities, our penchant for hate, our colloquial imperialism and our toxic ego caused us to choose Donald Trump as our 45th President. Just as Julius Caesar’s tragic flaw was his arrogance and malignant ambition, so too America suffers the malady of a caustic hubris. We are excessive and obnoxious. We are aggressive and slick. We bend the truth to suit our arc. And 510 days ago, we made manifest these very attributes when we elected Trump. Our knot had been revealed. This week, Donald Trump met with the North Korean leader Kim Jong-Un. I watched the live stream as the two of them did the diplomatic dance, the handshakes that Trump always tries to win, the weird pre-pubescent way that Kim makes his face. They stood there together, one resembling a bad child with dangerous toys, and the other resembling the greasy old guy that his children tolerate only because they don’t want to get written out of the will. And then, after the pomp and circumstance, came the bloviated press conferences, and though it’s very difficult for me to listen to this guy anymore, I had to hear his thoughts on meeting one of the world’s most infamous leaders. What do you think Trump said about Kim Jong-Un? He said that he was “funny and smart.” He said that the two of them had “really good chemistry.” He said that this man who has been cited by the United Nations Human Rights Council for committing acts like arbitrary detention, violation of freedom of thought, and enforced disappearance into prison camps “loved his people.” Then Trump doubled down on the obtuse by announcing that the US will stop military exercises with allies Japan and South Korea. If you don’t understand what this means, let me explain it in this way. Let’s say your cousin’s next-door neighbor threatened to kill him, so you go over to your cousin’s house and for 25 years, every day you check the locks on the doors and windows so that your cousin knows he’s secure, and then one day you decide that you aren’t going to check the locks anymore and you tell your cousin’s next-door neighbor this before you tell your cousin. That’s what Trump did after meeting with Kim Jong-Un for less than one day. I don’t know why but hearing that made me think about Aristotle’s analysis of Greek Tragedy. It made me think that we are now in the second part of this play, the unraveling. This is the part where although it may seem like the knot is loosening, an inherent flaw in our protagonist is causing everything to fall apart. In this play, however, Trump isn’t the protagonist. We are. In an era where we are as technologically advanced as we have ever been, with an economy that is strong, and a society that is becoming more and more global, it is our ideal of democracy that is unraveling. We are doing it all wrong. Just because we have the right to choose our leaders doesn’t mean that we should be choosing based on who we like the best or who we recognize from the television. Just because we are all in some ways different doesn’t mean that we should be treating one another differently based on those differences. And just because you meet a guy and hit it off for a couple of hours doesn’t mean that you stop helping your friends guard against his tyranny. Is there a McDonald’s in Singapore? If so, I bet those two ate some McDonald’s together.